International Training Course on "Design, Installation and Maintenance of Small Wind Turbine"
Home - Departments - Skill Development and Training - International Training - International Training Course on "Design, Installation and Maintenance of Small Wind Turbine"
Renewable Energy in particular Wind and Solar has become mainstay in meeting energy needs having achieved grid parity in term of costs as well as technical requirement. The wind energy has proved a highly successful energy option with installation of over 525 GW worldwide as on May 2018. It is estimated that viable wind power potential across globe is 72 TW, which is four times more than current World’s total energy demand. The major wind generator installation is in USA, some of the European countries and Asian countries like China and India and other countries catching up with the rest. Lack of skilled human resource has been one of the main barriers that hinders wind and other renewable energy integration. The National Institute of Wind Energy (NIWE), under the Ministry of New and Renewable Energy, Government of India has pioneered in promoting wind Energy and has contributed for promotion of wind energy as one of the primary energy sources in India. Decades of concerted efforts have started to yield gratifying results and today, Wind power contributes about 10% (34,193 MW) of the total Indian energy mix of 3,43,898.33 MW and stands fourth in terms of installed wind power capacity worldwide as on May 2018. Indian SWT Installation 2400 KW (Source : WWEA Report 2015). Small wind is the best decentralized form suitable for Urban setup and can work in complimentary pattern with Solar roof top. Ministry of New and Renewable Energy, Government of India has provided the needed impetus to the propagation of this technology through its subsidy program. With this vast experience, India can incorporate lessons learnt from its own experience to foster growth elsewhere in the globe. In this context, a five weeks International Training Course is scheduled by NIWE specially for African countries under Africa India Forum Summit-III (AIFS-III). The Course is sponsored by Ministry of External Affairs (MEA), Government of India. 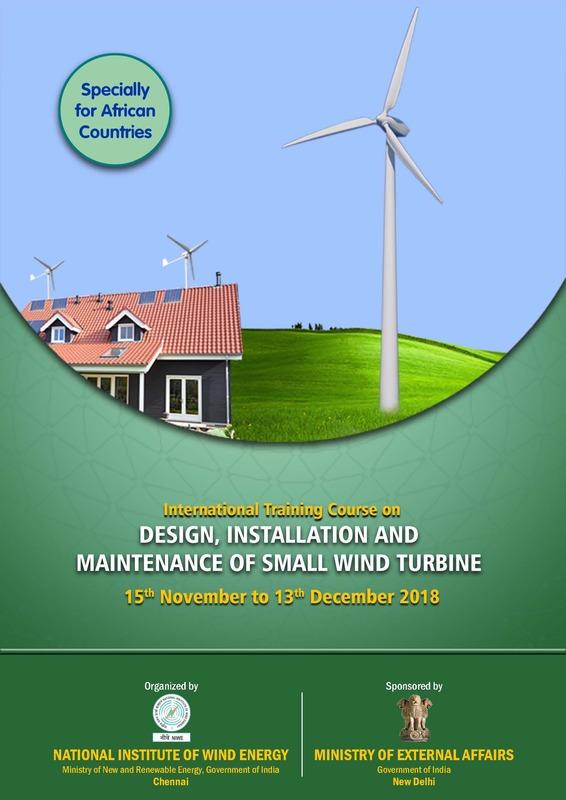 To highlight, NIWE has so far successfully conducted 28 international training courses, wherein 572 professionals from over 80 countries have been trained and has also conducted 27 national training courses and trained about 1300 professionals which includes special course on Small Wind Turbine Design, Installation and Maintenance. To build skilled human resource so that there will be advancement of wind energy in the participating countries. The resource persons for the training course would be scientists / engineers of NIWE, Small Wind Turbine Manufacturers, Experts and Engineers, who have contributed significantly for the development of small wind turbine technology. The practical training of design, construction and maintenance of small wind turbine will be provided by the National and International experts with a support of NIWE and Engineers of Minvayu, Auroville, Tamil Nadu near Puducherry, who have rich experience in design, construction, supply and providing training for the rural mechanics to build, install and maintain low cost wind turbines with local materials. The course content for the training has been carefully thought out syllabus with specific subject experts giving lectures and going through specific case studies such that, at the end of the course considerable useful knowledge transfer is perceived. Siting of SWT in Urban landscape. Design of Small Wind Turbine. Installation & Commissioning of Small Wind Turbines. Operation and Maintenance of Small Wind Turbines. Intensive practical training will be imparted on design, construction and maintenance of small wind turbines. The course is designed in such a way that the participants themselves will design the parts / components of the Small Wind Turbines from the low cost and locally available materials and construct, Install, commission of the turbine to produce power and also Operation Maintenance practices. The participants will spent more time at the laboratory for practical. The participants will also be participating the International Conference on Small Wind Turbine proposed during November / December 2018. Applicants should be from any one of the African country. Degree in Science / Diploma / Engineering Disciplines / ITI Holder / Rural Mechanic and Electrician with Knowledge in English. There is NO COURSE FEE for the participants of African countries and is fully funded by Ministry of External Affairs (MEA), Government of India under AIFS-III programme. The funding includes to and fro air fare, local travels, accommodation, living allowance and book allowance. Accommodation provided will be of international standards. The course will offer a good foundation on the principles of engineering behind wind energy technology, power generation & distribution along with financial viability and entrepreneur opportunities. The course would facilitate an invaluable forum for dialogue and open exchange of views and experiences with Indian scientists and professionals. The course would give a picture of complete know-how and pave the way to go about setting up a financially viable large wind farm project and Design, Installation and Maintenance of Small Wind Turbine. The total programme duration will be 29 days from 15th November - 13th December 2018. Interested candidates may download the application and contact Indian Embassy / High Commission of India in respective participant countries to submit application to forward to MEA and NIWE for processing. 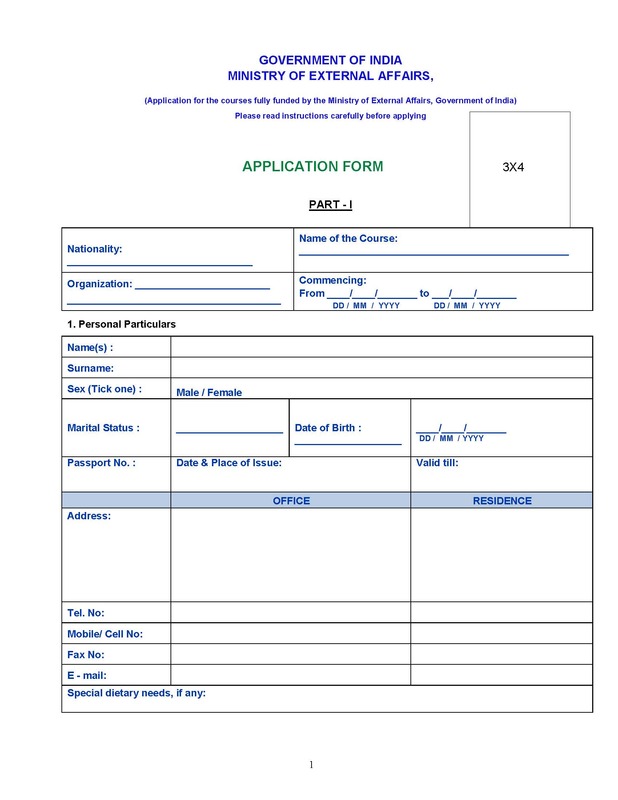 The application form may be downloaded from NIWE website @ http://niwe.res.in/department_itcs_itc.php and may also request through email.